‘Forged’ and ‘Casted’ are expressions to describe aluminium custom forged car wheels. Through the processes of Forging and Casting, aluminium wheels are subjected to high temperature and pressure to create high strength and durability car wheels. In casting, liquid aluminium is either poured or drawn utilizing a vacuum into a form, where it is moulded into the wheel shape and permitted to cool. Once the wheel has cooled minor alterations, for example, boring and trimming are made. While a cast wheel might be easier and more affordable to make, the sudden cooling of liquid aluminium may lead to porosity, which are basically irregularities in the material structure that can prompt breaking, oxidation, irregular finish and a decrease in the wheel's strength. To neutralize this, wheel makers are compelled to use work with higher tolerances which means wheels would be heavier in order to attain the desired structural integrity. Rather than casting, custom forged car wheels start as a strong bit of metal called as a "billet". This billet is then subjected to heat and extreme weight, which packs the material to form a crude forge. These crude forgings are "forged" into various profiles to take into account the formation of various wheel designs. The crude forgings are then machine turned and processed in-house utilizing our CNC machines to form the final shape and structure of the custom forged car wheels. 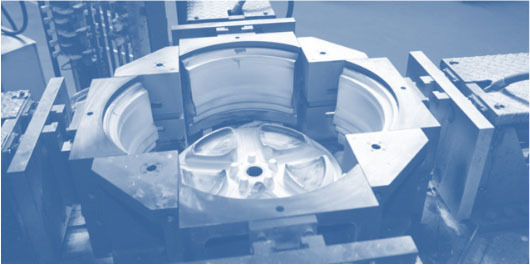 Because of the monstrous weight that the billet experiences during the forging procedure, the metal is less porous contrasted with casted wheels and has an interlocking and adjusted grain structure. In spite of the fact that this must be seen only under a magnifying lens, this structure results in enhanced quality, sturdiness, and protection from erosion and oxidation. Because of the steadier manufacturing, the same basic trustworthiness can be achieved utilizing less material in a custom forged car wheels versus a similar composed cast wheel as this lighter weight converts into enhanced vehicle performance. Thus, in case you're hoping to redesign your set of wheels, our custom forged car wheels won't just enhance the look of your vehicle, but add to your vehicle’s performance by decreasing unsprung weight, while giving unmatched quality, strength, and obviously style. 1. The process uses high temperature and pressure to change a block of cast aluminium into to the high quality multi directional grain structure. The aluminium stays solid all through the procedure and we are left with the final product which is a round and hollow shape of a wheel. 2 The custom forged car wheels blank is then put in a custom built spin forging machine to produce the rim section. The subsequent radial grain direction aligns the highest material strength towards the same direction as the operating loads. 3. Processing machines and CNC machines are used to accomplish the last setup resulting in a high quality, durable custom forged car wheels with no porosity and no welded joints. Give Oxwheels a chance to be your one stop shop. Purchase custom forged car wheels from us as we offer an extensive variety of custom forged car wheels at most reasonable costs in the market. When you purchase custom forged car wheels from us, they shout quality. We will attempt to furnish you with best styles available for your vehicle at competitive costs. We have been helping clients with all their custom forged car wheels needs because of our long period of involvement in the business and in particular our certain enthusiasm for custom forged car wheels. Just walk into our custom forged car wheels factory and you will see how passionate we are for anything automotive.